1. How to use Logik-ê densified logs? For a longer burning time, remove andirons from the fireplace. 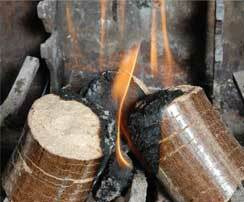 Logik-ê Densified Logs: A choice that is logical and environmentally friendly. 2. 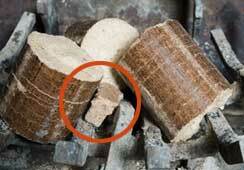 How to use Logik-ê Barbecue Briquettes? 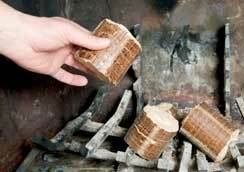 Logik-ê Barbecue Briquettes are easy to use! Lighting your barbecue has never been so easy! Logik-ê Barbecue Briquettes: the perfect companion for your barbecues! 3. How to use Logik-ê BBQ wood chips? For gas barbecues, place Logik-ê soaked chips (between 3 and 4 cups) on a smoker plate or wrap them in aluminium foil and pierce holes. Place plate or foil packet directly on lava rocks. Make sure the BBQ is off and cold. Turn on the BBQ and pre-heat for at least 10 minutes, until the flavoured chips start smoking. Grill your meat. For best results, keep barbecue lid closed to allow the aroma to fully penetrate the food. Chips will continue to smoke for half an hour. For charcoal barbecues, place moistened Logik-ê smoke flavoured chips directly over red hot briquets. Add more if needed. Enhance the taste of your barbecued meat with Logik-ê smoke flavoured wood chips!